Marketing: We'll Give You 'SUPER-Targeted' Keywords With "NO COMPETITION" For "PAGE 1" Rankings - INSTANTLY! 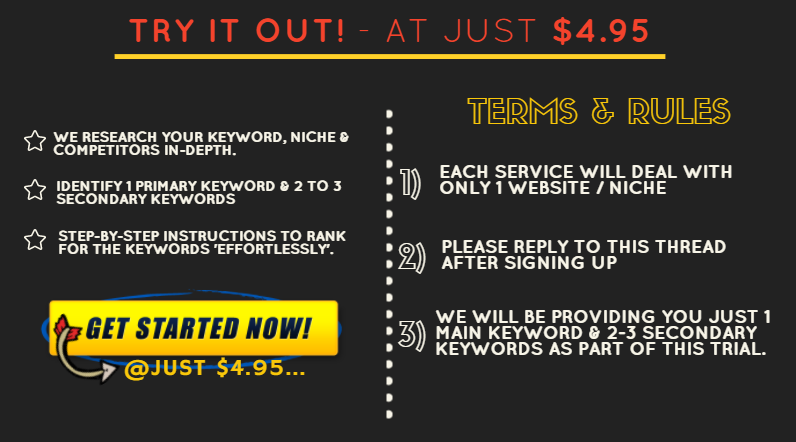 We'll Give You 'SUPER-Targeted' Keywords With "NO COMPETITION" For "PAGE 1" Rankings - INSTANTLY! Please feel free to send us a PM or eMail us at sales@buildmyrank.co if you have any queries or suggestions. Update: Received keywords from OP, and both of the keywords seems VERY promising! I'm very hopeful that I can rank for those keywords as my site is just one month old. I even received blog title so I won't have to worry about what words to use in the title. The report also has detail what to do, what not to do and step by step guide. I'm very impressed by the report! I can't wait to implement this! Will keep you guys updated once I publish the post with the given keyword. Sounds interesting. Are these extremely long tailed keywords. Also, in your experience, what is the average monthly search volume for these keywords. Do you have review copies available? Thank you very much for your interest in our service, these are not 'Extremely' long-tail keywords, they would usually be 4 to 6 keyword phrases. In my experience, the search volumes for the keywords are generally quite low, but if you use our method you will be ranking for multiple variations of the same keyword, which altogether can bring in quite a lot of traffic. If you implement our research and follow our guidelines to-the-point, you should start seeing 10 to 15 new visitors a day almost immediately, that is what we focus on. Let me check out this service. Ordering shortly. Just ordered and sent details. Thank you very much for your orders! We have delivered 2 orders over the past 24 hours, there has been a slight delay on our end, but please be patient, I will make sure all orders are delivered by the end of tomorrow. Please feel free to reach out to me if you have any further queries. Ordered...looking forward to the results. Thanks for joining our service, we have started working on your order and we'll see to that you have the results within the next 48 hours. Please feel free to reach out to us if you have any further queries. Can't wait to try out the keywords! Will post honest review here after the completion of experiment. I finally posted the article a week ago and I PMed the OP with the article link. So far, I haven't heard back from him. Looking forward for the ranking improvements! I'm sorry for the delay, I wasn't monitoring this thread for awhile. I have replied to your PM, please feel free to let me know if you have any further queries or concerns. are you can help me to rank my keyword ? You have personal contact like skype or anything ? Thanks for your interest in our service, we can help you identify the right keywords for your site and help you rank for those. We don't run an SEO service that helps you rank for your existing keywords. I have PM'd you my contact details, let me know more about your requirements and I'll see how we can help you. If someone wanted to do this for capture pages for now could that be done or does it need to be blog or sites for now? Thanks for your interest in our service, I don't think this would work well for capture pages. It would be difficult to optimize them for our keywords. This works best for blogs, you could maybe create a blog and then leverage the traffic onto your capture page. I replied to your PM, but didn't get your reply. Do you have Skype? I've sent you a reply, please check and let me know if you have any further queries. It's still in the 'Google dance' mode though, but I'm hoping the ranks will improve further. Hello everyone since i ordered keywords from this seller i figured i give my review on this but not yet. I`m still waiting for a full month which will be in 8 days and the results so far a terrible and i highly doubt they will change, will keep everyone posted in 8 days with detailed review. 1) Your page is ranked #16 for the main 'Focus Keyword' you've used, for the others, there is still plenty of potential to further optimize your article for other keywords. Apart from that one keyword, the other suggestions we made for the same 'Content Idea' aren't even mentioned throughout your article, so you cannot expect to rank for those. Please follow our 'Guide' to ensure better distribution of keywords and density throughout your content. 2) There are no H1 / H2 tags with the focus keywords, please make sure you distribute the keywords as headers. 3) Most new domains will be under Google Sandbox Effect for 1 to 3 months, your domain at the moment is just a month old, so you cannot expect 'Page 1' rankings right away. Although this is definitely not impossible, you'll need to create a strong 'silo' structure to get out of the sandbox. 3) You also seem to be worried that you've received just 2 clicks (as per your PM and Google Search Console screenshot), which is expected because much of the click-throughs (close to 60%) goes to the first 3 search results, you get almost nothing on 'Page 2'. 4) Your article is beautifully written and is very in-depth, you should most definitely be able to rank on 'Page 1', that being said, there are plenty of opportunities to further optimize your site. For example, including some of the keywords as H2 / H3 and creating 'Jump-To Snippets' can definitely increase SERPs and CTRs. I know that you are yet to see any quantifiable results using our service, but we've done our job in identifying 'Low Comp' keywords which are 'undoubtedly' one of the most rankable keywords in a highly competitive niche such as yours. Beyond this, there is nothing much we can do from our end. We will surely work with you for as long as it takes to reach 'Page 1' or we can issue a refund right-away, but calling our service 'Terrible' or your experience 'Terrible' is uncalled for, it would be great if you could at least describe why exactly your experience has been "Terrible So Far". Ok, this keywords have monthly US searches? How much? How many keywords I'm getting? Will be all related to my niche? Yes the keywords will have strong monthly search volumes, but our reports will indicate the global search volume, if you want 'US Specific Keywords' you can let us know while placing an order. You will be getting a total of 3 'Content Ideas' with the 'Full Package' which will contain a total of 10 to 12 keywords altogether. We will ensure that the keywords we suggest are all relevant your niche, keywords and goals. I know its been a while and i promised to come back here sooner but i was busy. However now i have a full review of this service. They keyword that ranks in 21 position only has 90 searches a month. The two main keywords that should bring over 720 and 480 searches are not ranking AT ALL. The other keywords that are showing up are variations of that keyword that should receive 90 searches a month, but those keywords have no search volume at all... I havent received A SINGLE click YET. So much for guaranteed rankings huh ? However there is more to this story. When i posted my first impression about this service the seller contacted me and asked for my website url. I was fine with it however.... some interesting things started to happen let me show you something. 63.141.244.250 - "GET /wp/wp-admin/setup-config.php HTTP/1.1" 404 134 "-" "Mozilla/5.0 (Windows NT 6.1; Trident/7.0; rv:11.0) like Gecko"
63.141.244.250 - "GET /blog/wp-admin/setup-config.php HTTP/1.1" 404 134 "-" "Mozilla/5.0 (Windows NT 6.1; Trident/7.0; rv:11.0) like Gecko"
63.141.244.250 - "GET /old/wp-admin/setup-config.php HTTP/1.1" 404 134 "-" "Mozilla/5.0 (Windows NT 6.1; Trident/7.0; rv:11.0) like Gecko"
63.141.244.250 - "GET /wordpress/wp-admin/setup-config.php HTTP/1.1" 404 134 "-" "Mozilla/5.0 (Windows NT 6.1; Trident/7.0; rv:11.0) like Gecko"
63.141.244.250 - /test/wp-admin/setup-config.php HTTP/1.1" 404 134 "-" "Mozilla/5.0 (Windows NT 6.1; Trident/7.0; rv:11.0) like Gecko"
46.105.217.69 - "GET /wp-content/plugins/wp-mobile-detector/resize.php?src=http://www.relationshiptips.club/cache/db.php HTTP/1.1" 404 191 "-" "Mozilla/5.0 (Windows NT 10.0; WOW64) AppleWebKit/537.36 (KHTML, like Gecko) Chrome/49.0.2623.75 Safari/537.36 OPR/36.0.2130.32"
46.105.217.69 - "GET /wp-content/plugins/wp-mobile-detector/cache/db.php HTTP/1.1" 404 191 "-" "Mozilla/5.0 (Windows NT 10.0; WOW64) AppleWebKit/537.36 (KHTML, like Gecko) Chrome/49.0.2623.75 Safari/537.36 OPR/36.0.2130.32"
46.105.217.69 - "GET /wp-content/plugins/formcraft/file-upload/server/php/upload.php HTTP/1.1" 404 191 "-" "Mozilla/5.0 (Windows NT 10.0; WOW64) AppleWebKit/537.36 (KHTML, like Gecko) Chrome/49.0.2623.75 Safari/537.36 OPR/36.0.2130.32"
46.105.217.69 - "POST /wp-admin/admin-ajax.php HTTP/1.1" 400 11 "-" "Mozilla/5.0 (Windows NT 10.0; WOW64) AppleWebKit/537.36 (KHTML, like Gecko) Chrome/49.0.2623.75 Safari/537.36 OPR/36.0.2130.32"
46.105.217.69 - "GET /wp-content/plugins/revslider/temp/update_extract/revslider/db.php HTTP/1.1" 404 191 "-" "Mozilla/5.0 (Windows NT 10.0; WOW64) AppleWebKit/537.36 (KHTML, like Gecko) Chrome/49.0.2623.75 Safari/537.36 OPR/36.0.2130.32"
46.105.217.69 - "POST /wp-content/plugins/wp-symposium/server/php/index.php HTTP/1.1" 404 191 "-" "Mozilla/5.0 (Windows NT 10.0; WOW64) AppleWebKit/537.36 (KHTML, like Gecko) Chrome/49.0.2623.75 Safari/537.36 OPR/36.0.2130.32"
27.255.79.246 "GET /?author=1 HTTP/1.1" 301 5 "-" "Mozilla/4.0 (compatible; MSIE 6.0; Windows NT 5.0)"
27.255.79.246 - HIT "GET / HTTP/1.1" 200 205417 "-" "Mozilla/4.0 (compatible; MSIE 6.0; Windows NT 5.0)"
27.255.79.246 0.033 - "POST /wp-login.php HTTP/1.1" "Mozilla/4.0 (compatible; MSIE 9.0; Windows NT 6.1; 125LA; .NET CLR 2.0.50727; .NET CLR 3.0.04506.648; .NET CLR 3.5.21022)"
27.255.79.246 0.018 - "POST /wp-login.php HTTP/1.1" "Mozilla/4.0 (compatible; MSIE 9.0; Windows NT 6.1; 125LA; .NET CLR 2.0.50727; .NET CLR 3.0.04506.648; .NET CLR 3.5.21022)"
27.255.79.246 - - "POST /wp-login.php HTTP/1.1" 403 189 "wp-login.php" "Mozilla/4.0 (compatible; MSIE 9.0; Windows NT 6.1; 125LA; .NET CLR 2.0.50727; .NET CLR 3.0.04506.648; .NET CLR 3.5.21022)"
27.255.79.246 0.021 "POST /wp-login.php HTTP/1.1" 200 1646 "Mozilla/4.0 (compatible; MSIE 9.0; Windows NT 6.1; 125LA; .NET CLR 2.0.50727; .NET CLR 3.0.04506.648; .NET CLR 3.5.21022)"
27.255.79.246 - "POST /wp-login.php HTTP/1.1" 403 189 "/wp-login.php" "Mozilla/4.0 (compatible; MSIE 9.0; Windows NT 6.1; 125LA; .NET CLR 2.0.50727; .NET CLR 3.0.04506.648; .NET CLR 3.5.21022)"
27.255.79.246 0.023 - "POST /wp-login.php HTTP/1.1" 200 1645 "wp-login.php" "Mozilla/4.0 (compatible; MSIE 9.0; Windows NT 6.1; 125LA; .NET CLR 2.0.50727; .NET CLR 3.0.04506.648; .NET CLR 3.5.21022)"
This is just some of my website logs. I am under constant attacks now. It makes you wander how a BRAND NEW website gets so much attention. Thank you for the order. Perfect as always!